View More In Body Composition Monitors. From Tanita, The Body Fat Experts, comes the BC 554 Ironman Innerscan Body Composition Monitor. 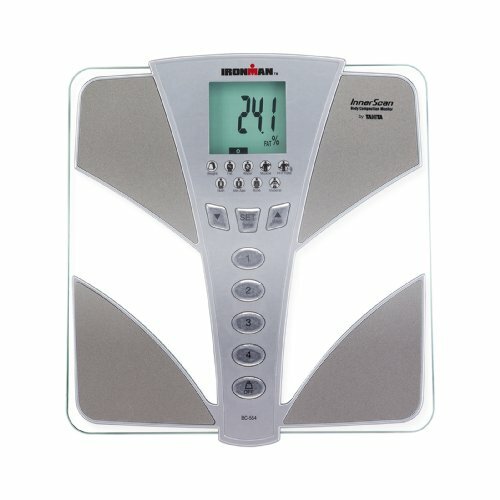 This scale is a unique and highly accurate body composition monitor. This product not only measures weight and body fat, it also tells you your muscle mass, body water %, basal metabolic rate (BMR), metabolic age, bone mass, visceral fat and rates your physique! The muscle mass feature indicates the weight of muscle in the body. The Body Water % is the total amount of fluid in the body expressed as a percentage of total weight. The BMR is the daily minimum level of energy or calories your body requires when resting (including sleeping) to function effectively. The Metabolic Age compares your BMR to the average age associated with that level of metabolism. The Bone Mass is the weight of your bone in your body. The Visceral Fat is the fat in the abdominal cavity (stomach), surrounding the vital organs. The Physique Rating is a rating of your body type; 1-9. Its sleek, modern design of glass and silver accents is a compliment to any bathroom. Monitor your health and fitness with an Ironman Body Composition Monitor. User-friendly, your personal information is stored in one of four permanent memory locations, step on the scale and your results are displayed in under 20 seconds. Large tempered glass and stainless steel platform supports a weight up to 330 lbs with 0.2 lb accuracy, comes with 4 AA batteries and is backed by a 3 year warranty. If you have any questions about this product by Tanita, contact us by completing and submitting the form below. If you are looking for a specif part number, please include it with your message.